An Englishman by the name of Charles Algernon Sidney Vivian arrived in New York in 1867 after a successful theatrical career in London. He wanted to imitate an English fraternity named after the (African) Buffalo, but others wanted an American animal, hence the Elk was selected for its peaceful and protective nature. While in England, Mr. Vivian, had heard the novelist Charles Dickens speak on benevolence. Inspired by Charles Dickens, Charles Vivian included the word “Benevolent” into our title; the Benevolent and Protective Order of Elks. It All Began With the Jolly Corks. Starting as a group of actors and entertainers bent on having fun AND avoiding a New York Excise tax in 1867 (Sundays were the ‘dry’ day), this convivial group called themselves the Jolly Corks (for a clever trick with corks they performed on the uninitiated to win rounds of drinks). That same year as membership grew, some members saw the vision to become more helpful in the community. Alas, two feuding factions split the group over different philosophies. 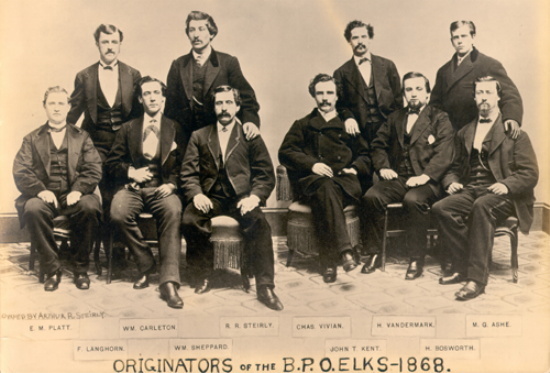 Fortunately, the latter faction moved forward with their new ideals and in February of 1868, the Benevolent and Protective Order of Elks was chartered–and with a great new spirit and direction, began to help Veterans, Scouting, Scholarships and more–wherever Charity, Justice and Brotherly Love were needed!